Posting time has been short of late, so while I work up a couple of longer posts here's a quick something I painted last week. 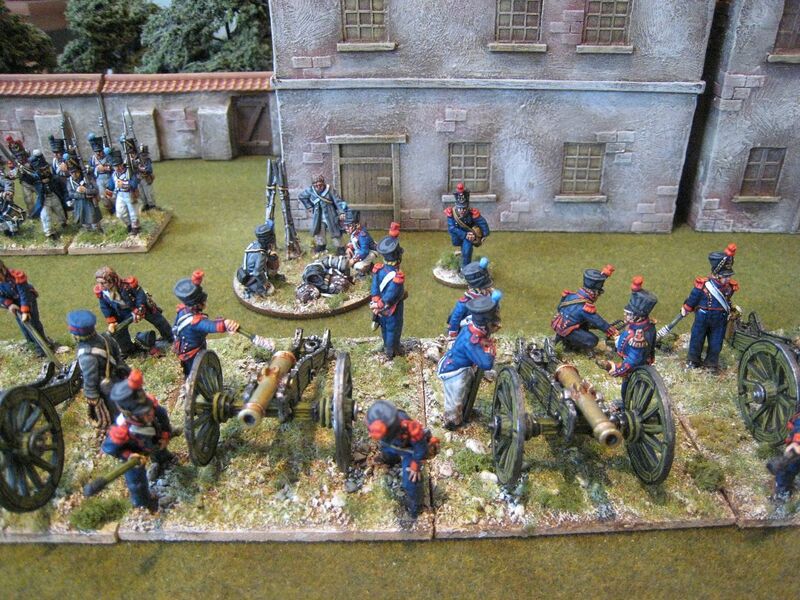 This is a set from the quite excellent Westfalia Miniatures, who produce a whole load of rather nice late Napoleonic sets that are well away from "mainstream" fare. 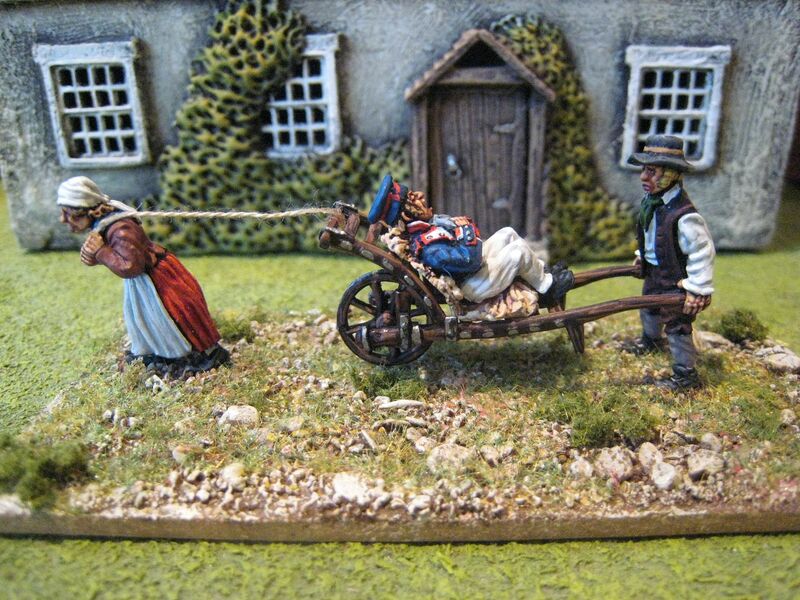 This set represents a couple of peasants dragging away a wounded French fusilier on a type of wheelbarrow. I think the inspiration comes from the German campaigns of 1813, but I see no particular reason why this vignette cannot be added to my 1815 collection. 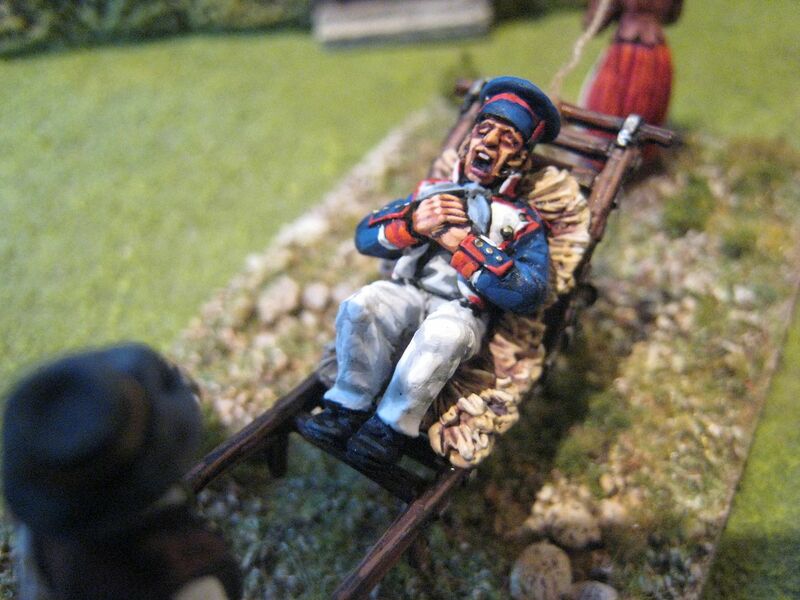 The French casualty looks like he's wearing an unbuttoned 1812 Bardin jacket, but as I recently noted with some Foundry French infantry it can sometimes be difficult to tell whether the figures are wearing pre- or post-1812 uniform. He's sitting on straw and being wheeled by a couple of civilian types. 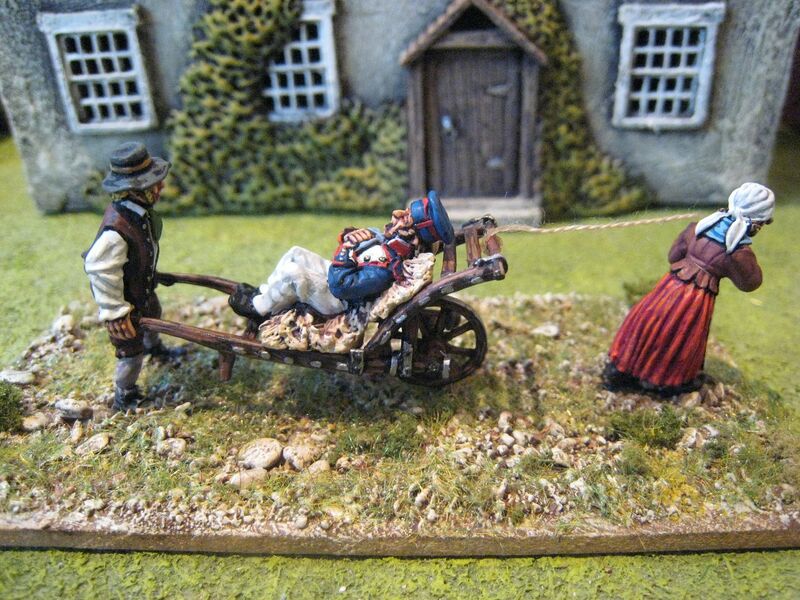 The engravings pictured on the Westfalia Miniatures site show women pulling the wheelbarrows, so I added some thread to represent rope. The sculpting of this set is superb, and the Paul Hicks figures have very characterful faces. 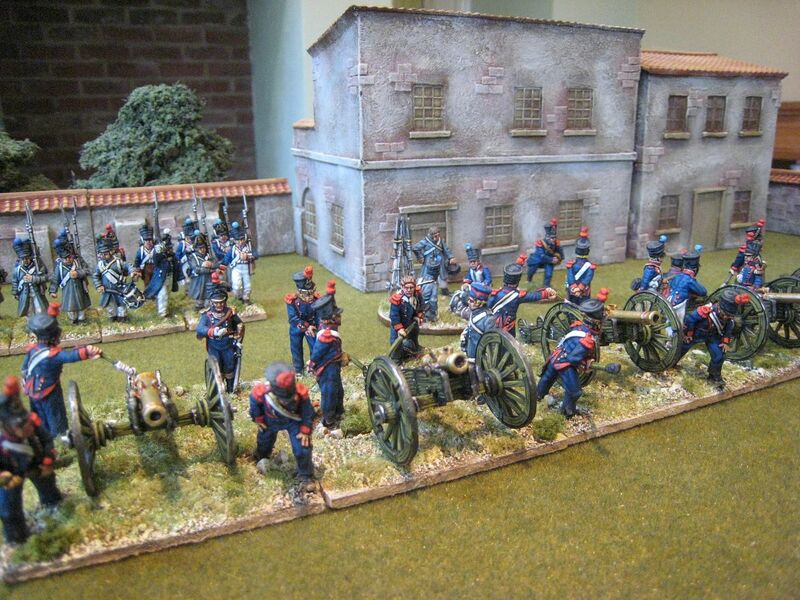 The farmhouse in the background of the photos is from Paul Darnell of Touching History (an excellent model-maker who is much missed from the wargaming scene). 3 figures. Painted February 2013. 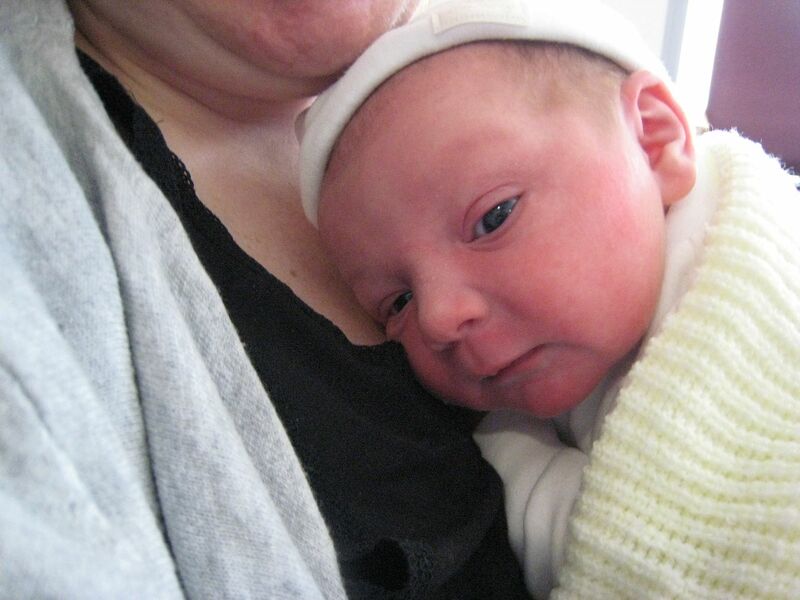 Monty arrived at 10.38am on Saturday morning, 16 February. He weighed 8.1 pounds, a couple of ounzes heavier than his brother. The Kiwi was in advanced labour for only a couple of hours, but the little fella gave us a fright when he came out and refused to breathe. I'v enever seen so many nurses appear so quickly and he was rushed off to "re-suss" before I'd even noticed that he was fully out. But he was fine and quickly showed that his lungs could power a very loud cry. He seems to be on Kiwi time, sleeping during the day and then perking up during the night. We're pleased to have him and Hugo will, I hope, enjoy being a big brother. My Facebook and other friends have had advance notice of Monty's birth, and they have done very well with "Monty" jokes. First place is currently held by Andy McMaster with his "someone deserves a Patton the back" remark - anyone have anything better than that? My family gathered to wet Monty's arrival yesterday. As always with a family gathering, wine was in abundance (and increasing it feels like it's always me that provides it!). I decided to pass on Monty's Kiwi heritage and instead return to the wines that I acquired when I was married. The Kiwi, then my fiancee agreed that we could have our wedding list with London wine merchants Berry Brothers & Rudd, but she then went off and openened a rival list at John Lewis. Naturally she told all her friends and family to buy from the John Lewis list, so leaving only my true pals buying from the BBR list. But my pals did good and picked out some stunning items (things like Ridge's Montebello and Sassicaia from Tuscany which still lurk at the back of the cellar) as well as several cases of other stuff that, after 3 years, are getting close to peak drinking. So tonight's wine was largely from the Wedding list (or at least wine that we were given as a result of getting married). A selection is in the photo. My father bought us a case of Verve Cliquot "La Grande Dame" 1998, a rose champagne which is still just holding up. I thought it might have been on the turn, but there was still complexity there, if a little loss of fruit. The wedding list produced two cases of claret, one of which was the 2005 vintage of "Les Tourelles de Longueville", which is the second wine of Chateau Pichon-Baron in Pauillac (a second growth in the Bordeaux rankings). It's drinking very well, probably not for keeping much longer; a lovely merlot-dominated wine. Before that we had some chenin blanc from Morgenhof in South Africa. Morgenhof was one of the 30-odd South African wineries we visited during our honeymoon in 2009, and I've followed their wines ever since. I think South African wines generally are still much under-appreciated. The quality is getting better every year and the wines are now very good value. The reds perhaps still often suffer from that "burnt rubber" issue that people argue about, but the whites are really quite good. Chenin blanc used to be SA's signature white grape variety, nowadays considered a work-a-day variety that s overshadowed by sauvignon blanc and chardonnay. However, the best SA chenins are fantastic and this one by Morgenhof is well worth trying (it's about £10). I thought it was like a more subtle Rhone viognier, lots of apples and peaches and very fresh. 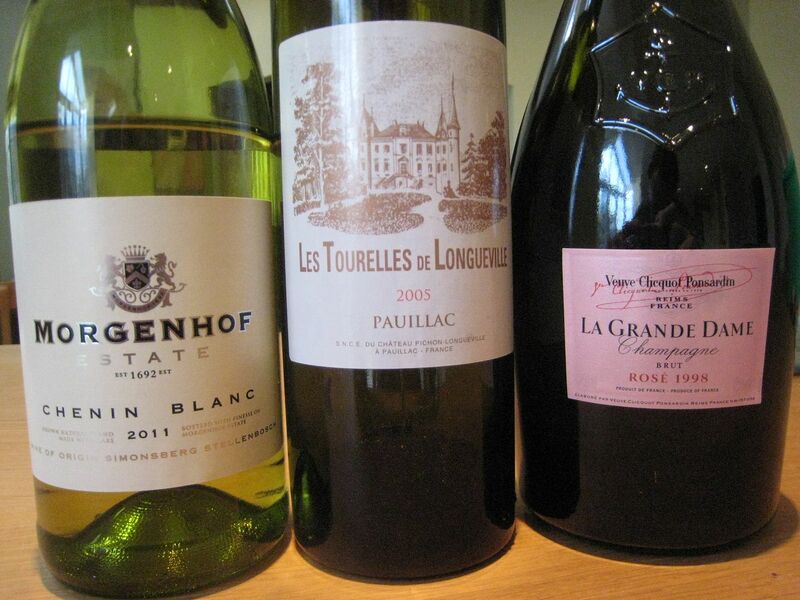 Incidentally, if anyone's interested in South African wines, I listed my favourites from our honeymoon here. Claude Charlet was the colonel of the 54e Régiment de Ligne in the 1st Brigade of the 1st Division of d'Erlon's I Corps at Waterloo. He was made acting brigade commander when the existing one, Général de Brigade Quiot replaced the divisional commander, Baron Allix de Vaux. Sources cannot decide whether it was Quiot's division or Donzelot's that was on the extreme left of d'Erlon's corps. According to Adkin and some others, it was Charlet's brigade that made the first assault on La Haye Sainte at around 2pm. In addition to the 54e Ligne, the brigade also contained two battalions of the 55e Ligne. 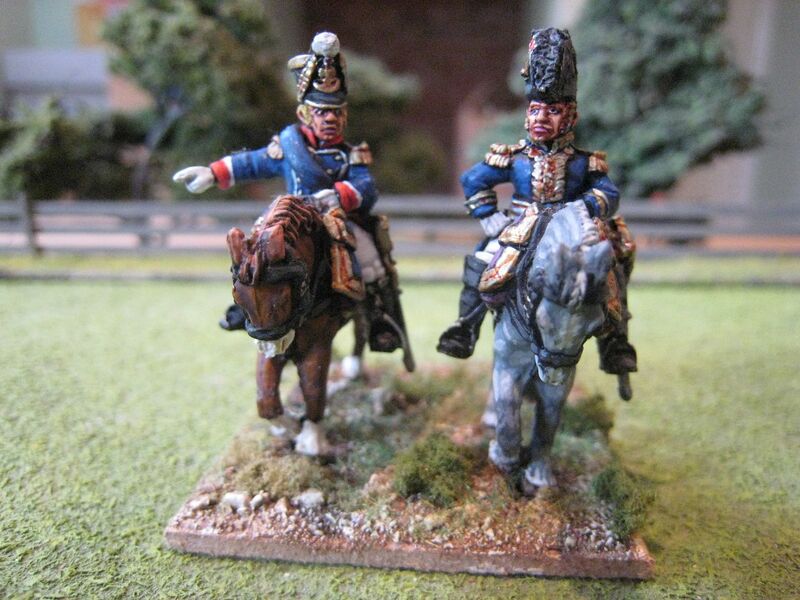 This command stand comprises two Perry figures, a mounted colonel and a sergeant from the "Line Infantry NCOs" box. As I don't have mounted officers in my French infantry battalions I needed to find other uses for the 3 Perry mounted colonels. 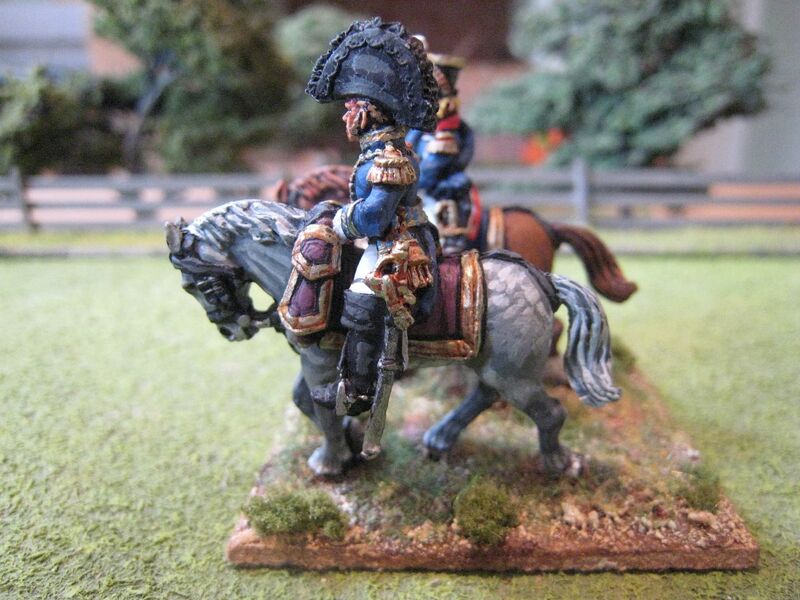 I'm trying to convert one into a general de brigade and a second will go on the Bachelu divisional command stand. Colonel Charlet was perfect for the third figure. I don't know whether he appointed another senior officer to take his place as commander of the two battalions of the 54e Ligne, or just left each battalion to its own commanding officer. But I thought the pointing NCO would make a good companion - perhaps Charlet's trying to work out where all four of his battalions are. In order to have Charlet and the NCO looking at each other I had to position Charlet in a way that makes it look as it's he's wondering off, which perhaps looks a little odd. There's no photo of the front of the grenadier sergeant because I see now that it's badly out of focus! I'm now almost up to date with the things I painted last year, save for all the ACW stuff and cavalry for the First Carlist War and the AWI. I'll try to post about those last 2 at the end of the week. 2 figures. Painted September 2012. 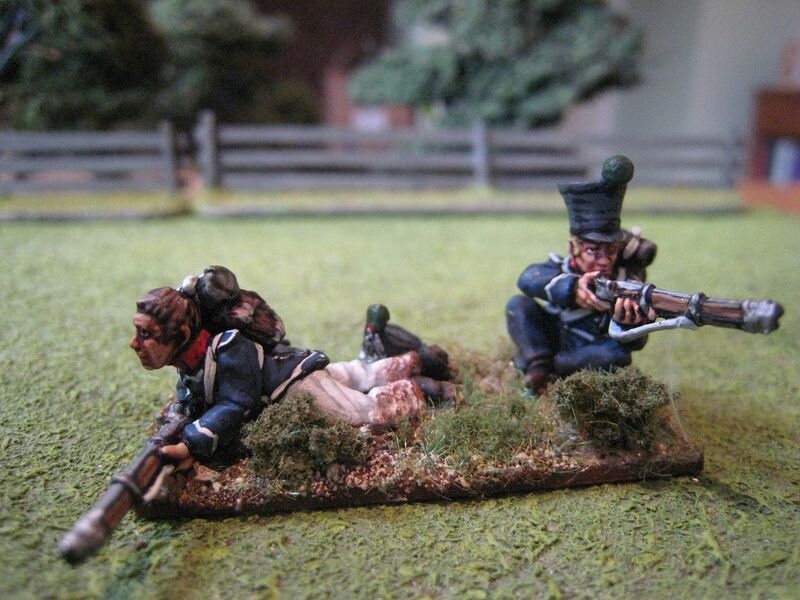 These Foundry figures are painted up as skirmishing chasseurs from a French light infantry battalion. 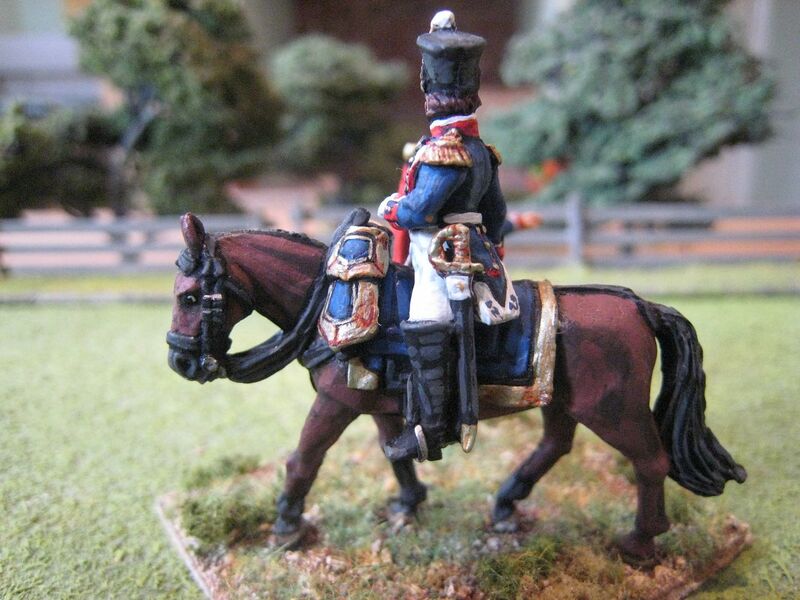 I'm not assigning these figures to any particular regiment - there aren't any legere regiments in the 1815 divisions I've been working on; I believe there were only half a dozen legere units present at Waterloo. I bought these figures from Foundry thinking they could be used as skirmishing Young Guard at Plancenoit; in fact, the figures are marketed as being "Young Guard". 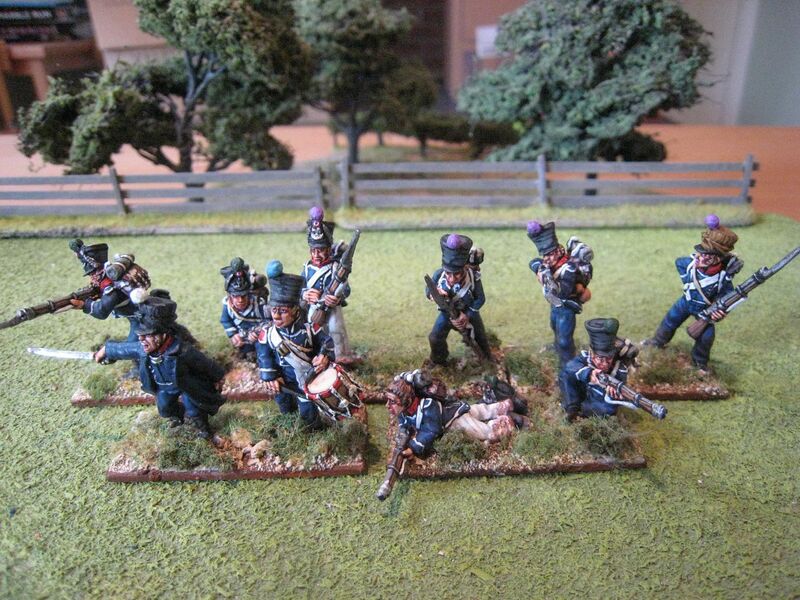 However, these figures don't have epaulettes, which I think is wrong for the Young Guard regiments in 1815. I have seen suggestions that there uniform shortages may have resulted in some men wearing coats without epaulettes and that, like the newly-raised Middle Guard untis the Young Guard may gave had a "rag-tag" appearance. However, my Perry figures all have epaulettes and I'd like to keep these dinstinctions for my Young Guard. The Imperial Guard needs to look a bit special, I think. So these figures were relegated to regular army. Not being well-versed in the actual gaming of later Napoleonic battles, I don't know the extent to which legere centre companies would have engaged in skirmishing. My reading suggests that the light infantry regiments were used in a similar way to the line ones, and whilst there may have been occasions where more than just the flank companies were sent out to skirmish, such occasions may well have been rare. But you never know, and these figures may come in useful at some stage. The figures are drawn from 3 of the 4 different chasseur companies and I gave a couple of them white trousers to mix things up a bit. 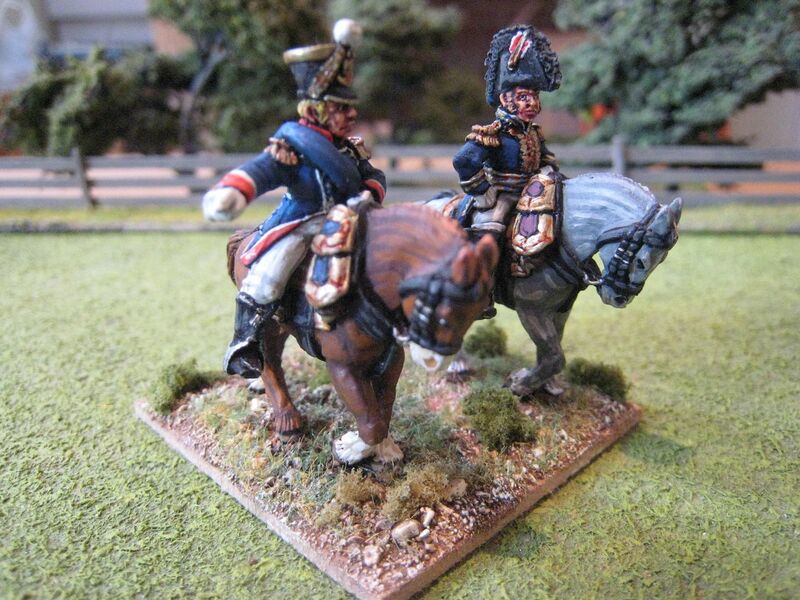 These are the first legere figures I have ever painted and I was initially caught out by some details of the uniforms. For example, I had assumed that the metal straps on the shakos were yellow metal like the line infantry, but it appears they were silver. The drummer figure clearly isn't in imperial livery, but according to the Mont Saint Jean uniform website it is perfecly acceptable to have some musicians in the older style uniforms as it's probably that not all of them would have received imperial livery coats in time for the Waterloo campaign. These are nice, characterful sculpts; well worth doing, I think. 10 figures. Painted October 2012. This is the second Young Guard command stand I painted last year, for the brigade under Baron Guye that comprised the 3rd Tirailleurs and 3rd Voltigeurs. Again, these are Foundry figures and this time one is clearly a general (or even a marshal with all that fancy braid down his front) rather than a mere senior officer. He is accompanied by an officer of Tirailleurs. I can't find out much about General Guye. He appears to have been born on 1 May 1773, became a General de Brigade in Janury 1810 and an officer of the Legion d’Honneur in March 1814. Apparently he died on 15 July 1845. Many of the Waterloo orbats refer to Guye as a "Maréchal de Camp". I understand that this rank is pretty much the same as "General de Brigade", and that the latter name was used for this rank during the Napoleonic Wars. For the sake of simplicity, I've referred to Guye here as a General de Brigade. He wears the light blue markings of that rank on his sash. It's a bit unfortunate that these two figures are both on the same horse sculpt. I did try to find a different one from the various mounted figures in the Foundry packs I had bought, but none of the other horses seemed to work. So I now have 2 generals to command my non-existent Young Guard, and no generals to command my existing Middle Guard. 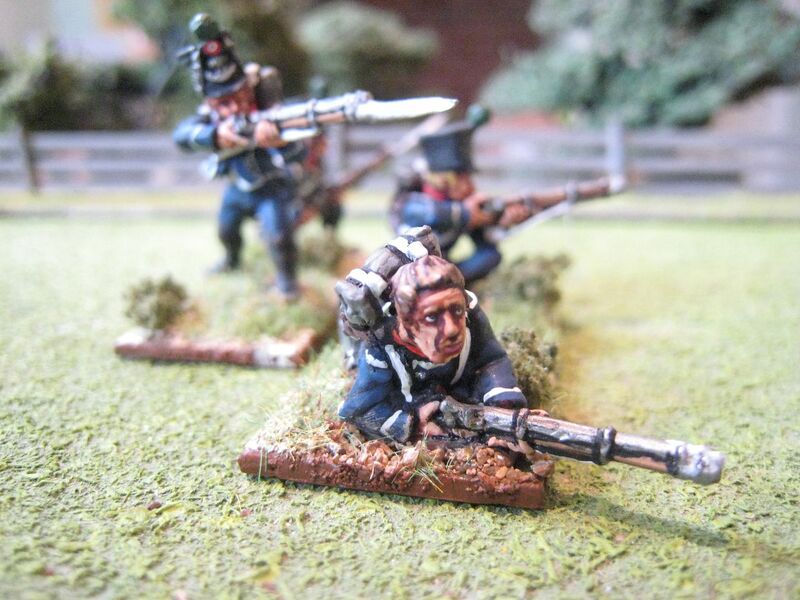 I am very much hoping that someone, whether Perry Miniatures or Victrix, do Young Guard in plastic. Perry do marching figures (and the chaps sitting on their packs), but I'd quite like a dramatic firing line for use in the Plancenoit fighting. 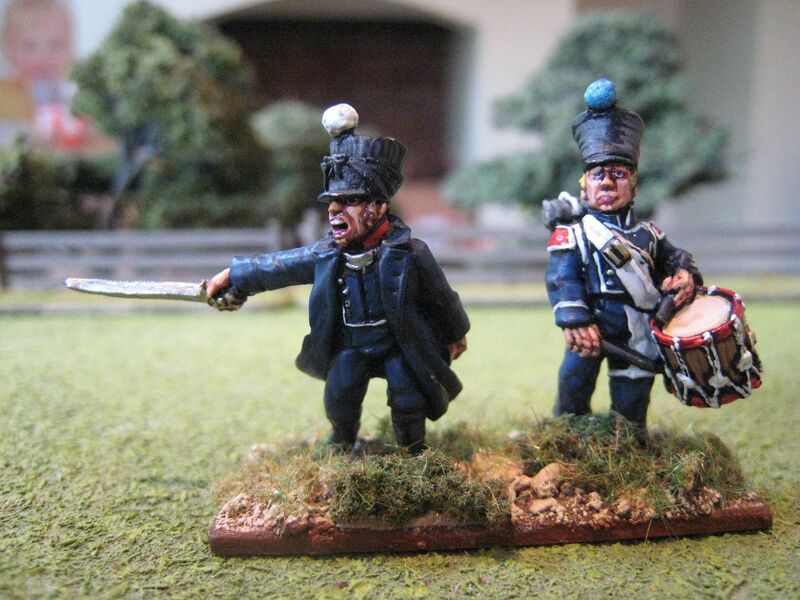 I bought some skirmishing figures which Foundry advertised as "Young Guard", but I didn't examine them sufficiently beforehand and they don't have epaulettes, which makes them useless for 1815 Young Guard. 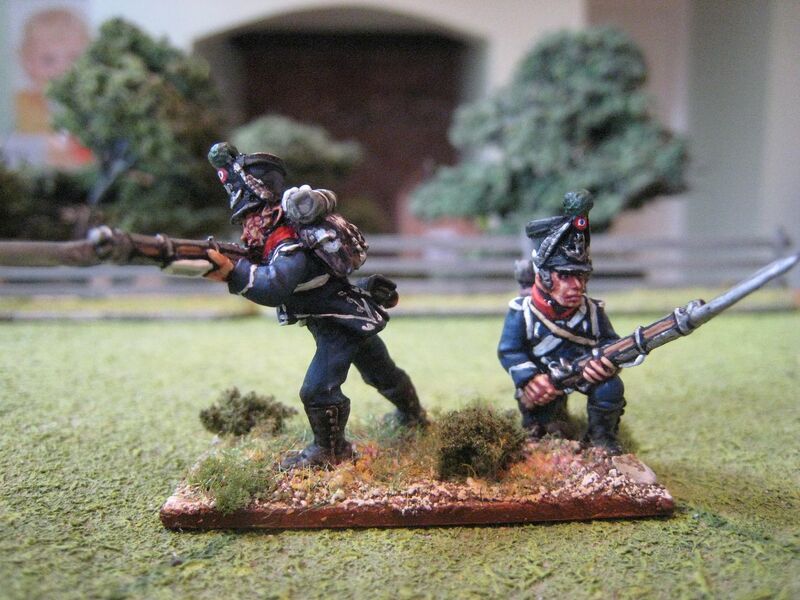 (I've painted these as normal light infantry, and I'll post on them at the weekend). 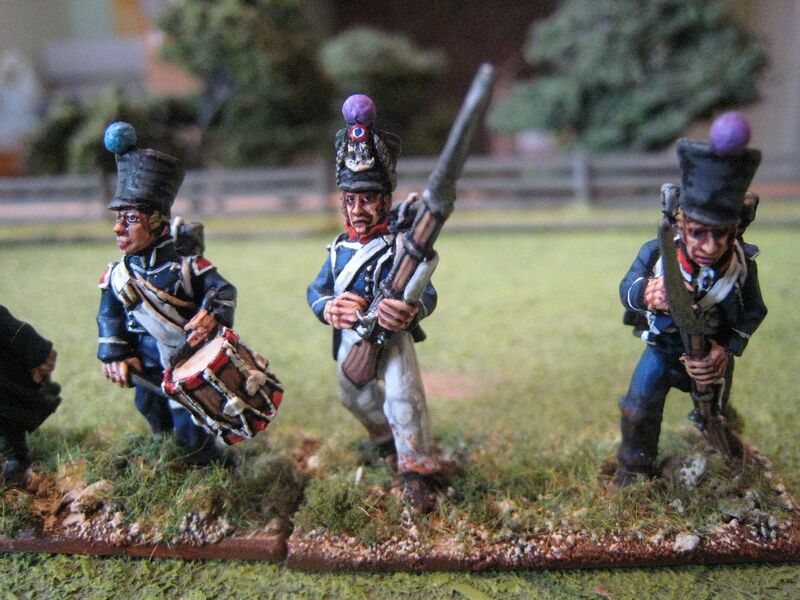 - AWI British: I already have plenty of British regiments painted up in metal, but there are a handful of larger units that I intend to do and re-do in plastic when the Perry set is released in March (I have in mind these regiments: 17th, 40th, 57th, 63rd). - AWI new Perry metal releases: so far the Volunteers of Ireland, northern militia for Bunker Hill and a couple more Continental regiments. - AWI highlanders: lots of King's Mountain figures for both myself and their manufacturer, Bill Nevin (these are quietly progressing in the background at the moment). I need to decide how to arrange my own figures for these; I have in mind some more skirmish-level actions that involved the 71st. 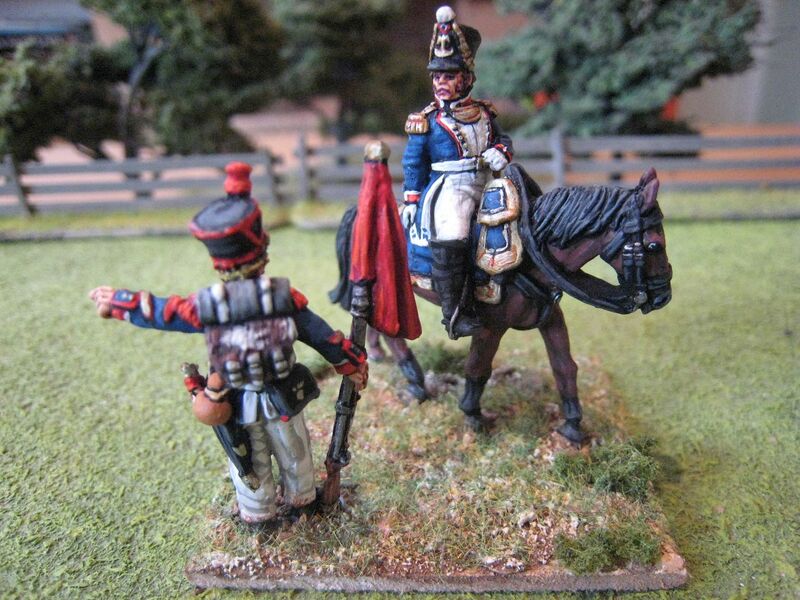 - AWI American cavalry: I started working my way through Eureka's Continental dragoons and then got side-tracked (I have a Carolina militia unit almost finished; it just needs a flag). 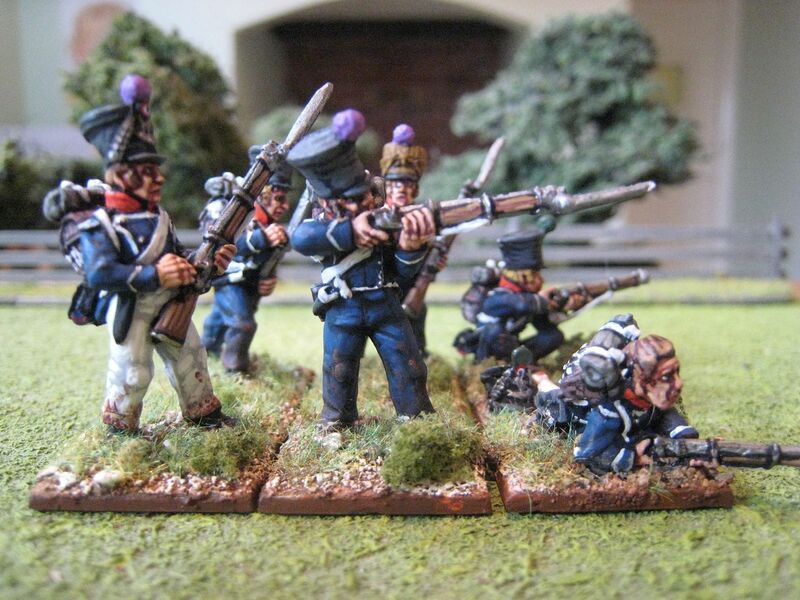 - 1815: Middle Guard - I want to finish Michel's division of the 3rd and 4th Chasseurs. - 1815: 1st Brigade/1st Division/I Corps - again, I'm half-way through the 54th Line from Quiot's division and would like to finish at least the 1st brigade this year. - 1815: bits and bobs from Westphalia Miniatures - these guys are producing some amazing stuff that I really want to paint up sooner rather than later.